Eastern White Pine, Scots Pine, Austrian Pine, Jack Pine and Red Pine. As well as White Spruce, Norway Spruce and Blue Colorado Spruce trees. The larvae tunnel into the inner bark on trunks and limbs of host trees. This causes a cavity. 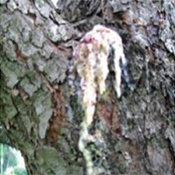 They feed on the resin that comes from damaged tissue. Stressed and wounded plants are most susceptible. The clearwing moth looks similar to yellow jacket wasps. It lays its eggs in midsummer in pruning cuts and on the bark of the trunk or limbs. The larvae tunnel into the inner bark to feed on resin from the damaged tissue. The mature larvae reach a length of about 25mm. Their body colour is usually near white to pink depending on which tree they are feeding on. Their brown head is smaller than their prothorax. Large amounts of pitch and frass form at the point of entry. Pupation occurs within the pitch mass from late May to June. The clearwing moths appear from the middle to the end of June, although others can emerge in July and August depending on locations. Two or three years are required to complete a life cycle. 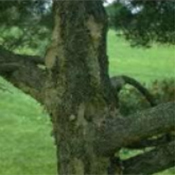 Maintain good tree health through proper pruning, watering and soil management. 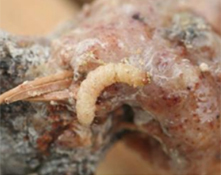 Larvae and pupa are found under the pitch masses. They can be removed and killed. No registered chemical controls exist.